I believe in getting nutrients from food whenever possible. 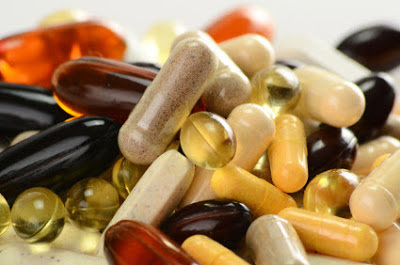 I also believe that it's sometimes easier said than done due to things like soil depletion and genetic glitches, and sometimes certain health situations warrant a little help from our supplement pals. So, I take supplements based on my specific health issues. I'm always curious about what supplements other people take (I often compare arsenals with friends! ), and I thought you might be curious about what I'm taking. I have a history of megaloblastic anemia and symptoms of low B-12. I'm not sure if it was from being a vegetarian for so long, from autoimmune disease, or if I lack intrinsic factor. But low B-12 isn't something you want to mess around with because it really impacts your brain and eventually results in neurological damage. Methylcobalamin is one of the active, methlyated forms of B-12, and in sublingual lozenge form it's ready to be absorbed right into the bloodstream and go to work. I take 10,000-15,000 mcg. Some people are terrified of any form of Omega 6 fat, but we do need some. And not everyone converts O-6 into Gamma-Linolenic Acid (GLA) efficiently. GLA inhibits the formation of inflammatory prostaglandins, which translates to things like relief from menstrual cramps and help for skin conditions like eczema. Sources of GLA like Evening Primrose and Borage Seed oil can be helpful in many inflammatory conditions. I take Evening Primrose to help with hormone balance and for hair issues related to Hashimoto's (autoimmune thyroid disease). My dosage varies with my menstrual cycle and is between 500-1500 mg.
Selenium is important for thyroid hormone conversion and, in the case of Hashimoto's, for managing antibodies. Selenium is also a great antioxidant, reduces cancer risk, and is involved in reproductive health. You can also get selenium from brazil nuts, but I don't always feel like eating brazil nuts. Fish oil quality can be pretty iffy due to the manufacturing process which often includes distillation, subjecting the delicate omega 3 fats to heat. Heat, oxygen, and light = oxidized, rancid omega 3's. I like this one because it's not nearly as refined as most and contains some naturally occurring astaxanthin for extra benefits. I don't usually take it on days that I eat salmon. This curcumin is THE. BOMB. It's the most well absorbed form on the market and you don't need as big of a dose as other brands. I use it to keep my autoimmune response balanced and, if I injure myself, I take extra to reduce the inflammation. I think it also helps with menstrual cramps. Curcumin is an all-around fabulous preventative supplement. N-acetylcysteine (NAC) is an amino acid that increases glutathione production. Glutathione is a powerful antioxidant, detoxifier, and a deficiency is present in autoimmune thyroid disease. I've also found it helpful for fighting off colds. This is vitamin D3 in olive oil and nothing else. The main reason I take D3 year round is that it's an important immune modulator. My dosage fluctuates seasonally. Right now I'm taking 3000 I.U. We all need magnesium. You've probably heard that it's involved in over 300 essential metabolic reactions in the body. It's vital for the absorption of calcium and it's essential for proper vitamin D utilization. The chloride form is well absorbed and this product is nothing but magnesium chloride, water and lactic acid- no fillers. I like it because it's easier on my G.I. tract than mag. citrate and I don't need a big dose to feel the effectiveness. My dosage varies according to symptoms like muscle soreness, but I usually take 1/2- 1 tsp. There you have it- my current regimen. I use other things here and there like gelatin powder, dessicated liver powder, and undenatured, grass-fed whey protein, but I consider those to be more like foods than supplements. Hope you enjoyed a little glimpse into my arsenal! I really like your health approach of getting nutrients from food whenever possible. I use supplements because I think the environmental and mental stress we place on ourselves depletes our internal resources faster than in previous times. The good news is that our standard of living affords us rich nutrition. But everyone needs a little help now and then. I personally like using Ubiquinol with Authentic Shilajit. I especially like this brand of shilajit from Lotus Blooming Herbs because I know it is from the Himalayas...in fact, I watch his mountaintop journeys to source the mineral on the Lotus Blooming Herbs facebook page where he shares pictures. No, I never took X-FLM. Dr. Kharrazian has moved away from direct TH1/TH2 modulation in favor of T-reg support and TH-17 modulation using Oxicell glutathione cream, curcumin (Apex Turmero), and resveratrol (Apex Resvero). Of course, all of this also reduces inflammation, big-time. I'm currently on that trio of supplements, under the guidance of a functional medicine practitioner that I recently started seeing. I'll be writing about my updated regimen, soon.